One Piece World Seeker is an open-world adventure game based on the iconic manga and anime known as One Piece. 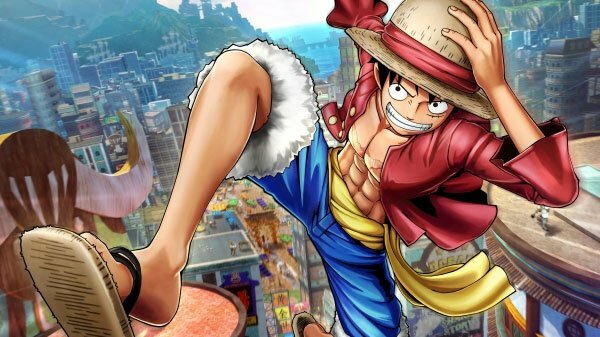 Developed by the team at Ganbarion and published by Bandai Namco, One Piece World Seeker allows fans to experience a brand new story featuring Monkey D. Luffy and the Straw Hat Pirates. Caught in the middle of an anti-military rebellion, Luffy will have to make new allies and pick a side in all of the chaos. The story opens with members of the Straw Hat Pirates working to break Luffy out of the Sky Prison where he is incarcerated. After a brief battle, the team succeeds in doing so, but not without a cost: Several members of the crew get separated or jailed. Once Luffy escapes the floating island and crashes below, he makes it his first priority to save his friends. It's here where we meet Jeanne, a new character exclusive to World Seeker. She gives Luffy his first tip on where to head if he wants to find his crew members. Jeanne’s role in the plot becomes more and more vital as things move forward. For a character that doesn’t appear in the source material, I found Jeanne to fit in perfectly with the characters and world of One Piece. Her charm and wit made her one of my favorite characters coming out of World Seeker. The first few hours of One Piece World Seeker’s story see players roaming around Jail Island searching for members of the Straw Hat Pirates. You gather information on their whereabouts, then force your way into their holding place and break them out. Generally speaking, it's fun going around the island rounding up members of the crew, especially considering that members of the Straw Hat Pirates are some of the game's only characters with any semblance of personality. The way Luffy interacts and speaks to members of his crew does a good job at spotlighting their relationships and rich history together, but unfortunately, the story fails to get better or pick up any sort of momentum after its opening. The central conflict is entirely predicated on political strife between the Marines and the citizens who oppose them, but World Seeker does very little to get you invested in this narrative besides the story work done with Jeanne. Being a leader in the anti-navy rebellion, Jeanne has layers to her goals and motivations. I found myself buying into her character and rooting for her throughout the game. She really is the only character that gets anything close to a fulfilling story arc. I spent the greater portion of my time with One Piece World Seeker waiting for the story to take the next step; by the time it did, the credits began to roll. From a gameplay standpoint, World Seeker has some ambition to it. 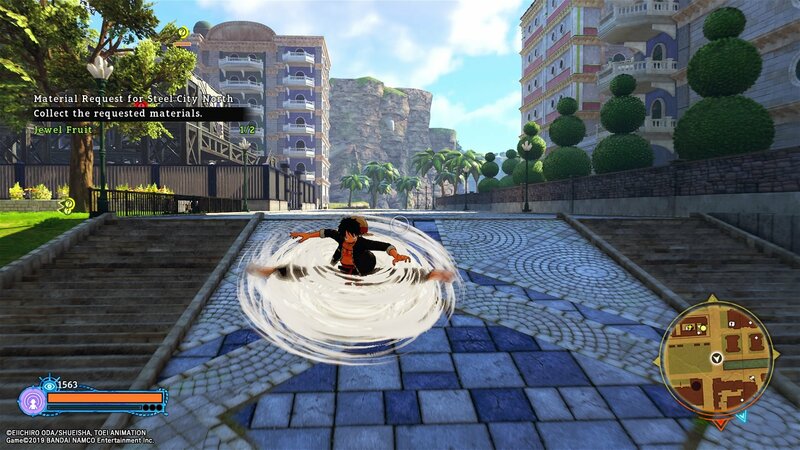 It’s the first game in the One Piece franchise that looks to tackle an open-world setting. However, I found the world itself to be bland. Jail Island consists of different locations with very little characteristics to help set them apart from one another. The drab environments didn’t completely sour the experience, but none of the cities or towns did much to leave a lasting impression me. Open-world settings are fun when different different areas host unique characters and traits that make them special. In a game based on the One Piece property, I expected the world to be bursting with personality. Sadly, that was not the case. The combat system is perhaps best described as serviceable. Luffy has some pretty funky powers that make for cool animations when taking down baddies. That being said, World Seeker usually has you battling several enemies at once without the tools to engage them properly. It would have helped to have some sort of lock on system so that I could easier focus on the foes giving me the most trouble, but no such feature exists. The moves Luffy uses can be built and improved upon via the skills tab in the menu. I found myself enjoying the battles much more after I had some new tricks up my sleeve. 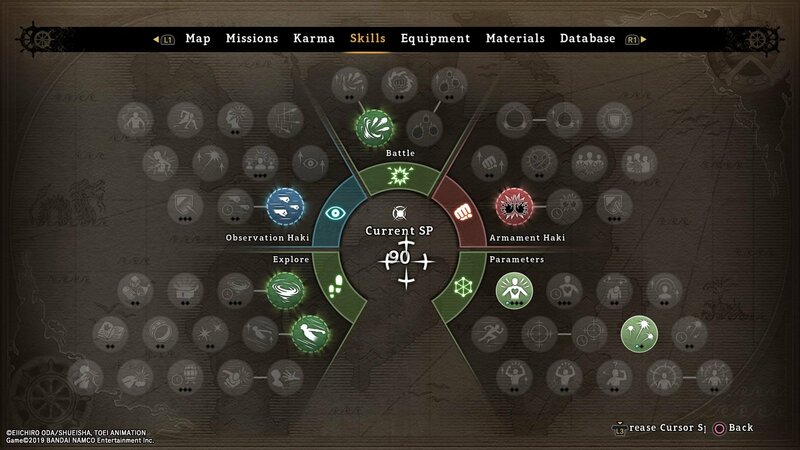 However, not every ability in the skill tab is combat-oriented. Many of them provide some quality-of-life improvements for Luffy when exploring the world: The Gum Gum Rocket specifically was one of my favorite abilities that World Seeker had to offer. I used it to propel myself from ledge to ledge and soar through the sky. It was a fun way to traverse the world and get from objective to objective. Beyond skills, Luffy has two primary modes: Observation Haki and Armament Haki. These two modes provide different abilities when navigating the world as well as when fighting. 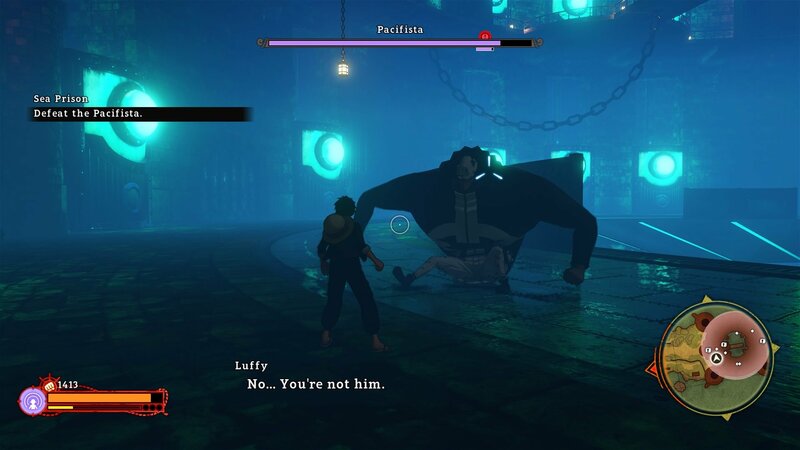 Observation Haki dials in on quick and speedy combat while giving Luffy the ability to detect enemies and objects at a distance, similar to the Eagle Eye ability from the Assassin’s Creed games. On the other hand, Armament Haki is much more aggressive, focusing on devastating blows and allowing players to block attacks. I quite enjoyed this concept. It encouraged me to approach different scenarios with whatever Haki would serve me best. Another cool element that One Piece World Seeker introduces is the “Karma” feature. This tab in the menu keeps track of the relationships between all of the supporting characters met throughout the campaign. You can also use it to see which tasks will improve your karma with a particular character. Completing side quests, finishing story chapters, and traveling to certain areas all contribute towards karma. Having a high karma will unlock new side missions and bonus quests for Luffy to complete as well as unlock rewards. Karma is a certainly neat feature with the capcity to be something awesome if the team decides to build it into a future game. Fans of the One Piece anime and manga will probably find more to enjoy in the World Seeker experience than most gamers. Once you get past the pretty surface, you’ll find that there isn’t much below it. The story is middling, lacking the excitement and action you would expect from a property like One Piece. A small handful of intriguing characters along with some fun unlockable abilities were the sole highlights of my playthrough, but weren't enough to make up for the game's many shortcomings otherwise. Ultimately, One Piece World Seeker serves as a rather mediocre adaptation of a property that has the potential to be so much more. This review is based on a PS4 digital copy provided by the publisher. One Piece World Seeker is available now on the PlayStation Store, Xbox Live Marketplace, and Steam for $59.99. The game is rated T.